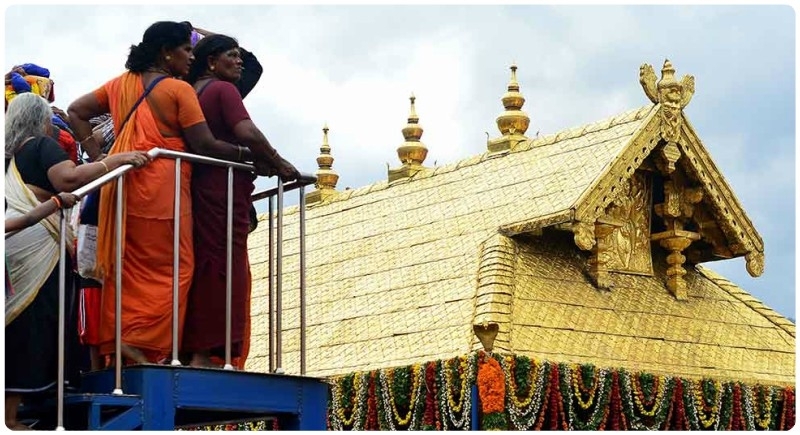 Thiruvananthapuram, September 28: The Supreme Court today paved the way for the entry of women of all ages into the Ayyappa temple at Sabarimala in Kerala. The five-judge constitution bench headed by Chief Justice Dipak Misra, in its 4:1 verdict, said banning the entry of women into the shrine is gender discrimination and the practice violates rights of Hindu women. It said religion is a way of life basically to link life with divinity. While Justices R F Nariman and D Y Chandrachud concurred with the CJI and Justice A M Khanwilkar, Justice Indu Malhotra gave a dissenting verdict. The court pronounced its verdict on a clutch of pleas challenging the ban on the entry of women of menstrual age in Kerala's Sabrimala temple saying law and society are tasked with the task to act as levellers. The bench passed four set of separate judgements. The CJI said devotion cannot be subjected to discrimination and patriarchal notion cannot be allowed to trump equality in devotion. He said devotees of Lord Ayyappa do not constitute a separate denomination. The CJI said the practice of exclusion of women of 10-50 age group cannot be regarded as essential religious practice and Kerala law denies rights to women on the ground of physiological reasons. Justice Nariman said the Sabarimala temple custom barring women of 10-50 age is not backed by Article 25 and 26 of the Constitution. The custom of barring women is violative of Article 25 (Clause 1) and Rule 3(b) of Kerala Hindu Places of Public Worship (authorisation of entry) Rules, 1965 is struck down by Justice Nariman. Justice Chandrachud said religion cannot be used as cover to deny rights of worship to women and it is also against human dignity. He said the prohibition on women is due to non-religious reasons and it is a grim shadow of discrimination going on for centuries. Devotees of Lord Ayyappa do not form separate religious denominations, Justice Chandrachud said and added that any custom or religious practice if violates the dignity of women by denying them entry due to her physiology is unconstitutional. He said the popular notion about morality can be offensive to the dignity of others and exclusion of women because she menstruates is utterly unconstitutional.Justice Chandrachud held that exclusion of women is violative of the right to liberty, dignity and equality.